In logistics and material handling applications, safety, security, and fast reliable data collection/communications is imperative. From inventory management to order fulfillment, asset tracking, and shipping/receiving, the logistics ecosystem requires advanced solutions to keep it running smoothly. Winmate understands the demand of modern technologies for handling capabilities and presents a full line of rugged vehicle mounted computers to meet the growing market demands. Winmate’s vehicle mounted computers are designed for in-vehicle applications and support various RAM mount solutions. Vehicle docking solutions and barcode or RFID scanners allow for simple one-handed docking/undocking for data collection and on-the-move computing tasks. 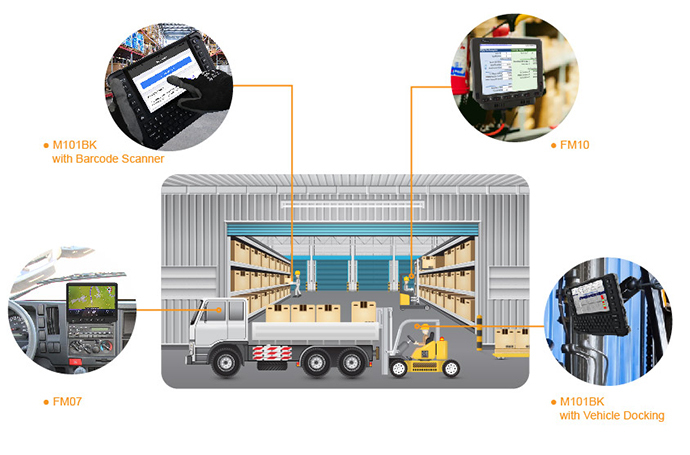 In big warehouse facilities, onboard GPS makes it possible to take the most effective route to the next rack location, indicate the location of the forklift and navigate around, and thereby helps to increase productivity.